This paper examines the evolution of the Spanish gasoline market from the abolition of the state oil monopoly (January 1993) to "complete" liberalisation (October 1998). With the restructuring of the Spanish oil sector during the 1980s and early 1990s, a highly concentrated oligopoly emerged in the automotive fuels market. A system of price ceilings replaced the state administered prices in July 1990. Since then, new domestic and foreign operators have entered the market, particularly along the coast, near import terminals. Prices went up and then declined. These developments can be explained by an interplay of factors such as: the gradual decline in co-operation among the Spanish firms; the loss of market share of the largest of these, Repsol; the entry of independent operators and supermarkets; and the impact of the ceiling price system. By mid-1998 this system was abolished as the government considered it an "impediment" to further market liberalisation. However, some crucial barriers to the entry of new suppliers remain. 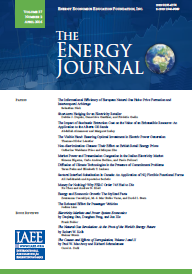 This paper evaluates three energy-sector market transformation programs: the U.S. Environmental Protection Agency's Green Lights program to promote on-grid efficient lighting; the World Bank Group's new Photovoltaic Market Transformation Initiative; and the federal grain ethanol subsidy. We develop a benefit-cost model that uses experience curves to estimate unit cost reductions as a function of cumulative production. Accounting for dynamic feedback between the demand response and price reductions from production experience raises the benefit-cost ratio (BCR) of the first two programs substantially. The BCR of the ethanol program, however, is approximately zero, illustrating a technology for which subsidization was not justified. Our results support a broader role for market transformation programs to commercialize new environmentally attractive technologies, but the ethanol experience suggests moderately funding a broad portfolio composed of technologies that meet strict selection criteria. The wave of electricity market restructuring both within the United States and abroad has brought the issue of horizontal market power to the forefront of energy policy. Traditionally, estimation and prediction of market power has relied heavily on concentration measures. In this paper, we discuss the weaknesses of concentration measures as a viable measure of market power in the electricity industry, and we propose an alternative method based oil market simulations that take advantage of existing plant level data. We discuss results from previous studies the authors have performed, and present new results that allow for the detection of threshold demand levels where market power is likely to be a problem. In addition, we analyze the impact of that recent divestitures in the California electricity market will have on estimated market power. We close with a discussion of the policy implications of the results. Using a complete information game-theoretic model, we analyze the performance of different electricity auction structures in attaining efficiency (i. e., least-cost dispatch). We find that an auction structure where generators are allowed to bid for load "slices" outperforms an auction structure where generators submit bids for different hours in the day.